The collection ranges from fine early wood and paper mache to superb French bébés and poupées, to the rarest of the German bisque art characters, mostly all in original costumes. In Newport Beach, CA. 15" (38 cm.) Bisque socket head portraying adult man with angular features, blue glass eyes set deeply into narrow eye sockets, tinted ochre eyeshadow, arched feathered b...morerows, accented nostrils on strongly shaped nose, closed mouth with accent line between the lips, brunette mohair wig, French composition and wooden fully jointed body. Condition: generally excellent. Marks: Van Rozen France Depose (raised lettering at back of head). Comments: Paris, circa 1915, designed by Belgian-born artist Jeanne Van Rozen in the early 20th century. Acclaimed for her bronze sculptures of animals and soldiers, the artist became inspired by the French Renaissance of the Doll movement of the early 1900s, sculpting two different facial models for dolls, one smiling and the other (this example) solemn. According to The Encyclopedia of French Dolls by Theimer "it is likely that only a very few were ever made". 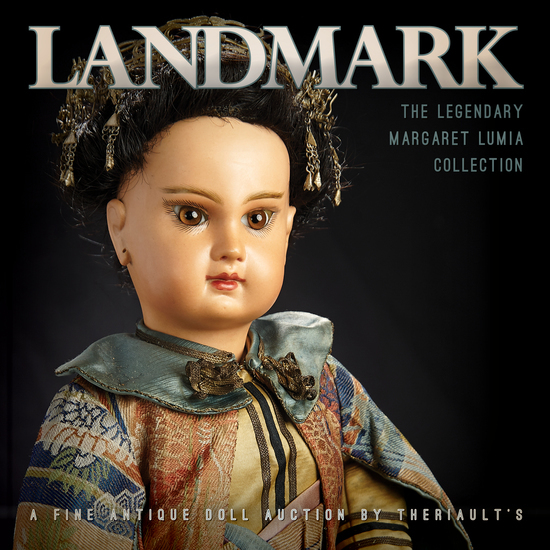 Value Points: the very rare model with historical significance in doll chronology, sculpted by renowned named artist, with compelling expression enhanced by hand-pressed details, wonderful antique woolen uniform with epaulets, brass buttons, and bi-corn hat. 10" (25 cm.) The finely carved horse has shaded cream/tan horse hide cover, his head turned to the side, with amber glass eyes, horsehair mane and tail, and very elaborat...moree original harness and saddlery. Excellent condition. Germany, circa 1885. 4" (10 cm.) Each is all bisque with sculpted hair and painted facial features, jointing at shoulders and hips, one has rare sculpted helmet and moustache, and the other h...moreas metal helmet with gilt decorations, each wearing original woolen costume. Condition: generally excellent. Comments: Germany, circa 1900. Value Points: rare sculpted helmet model. 15" (38 cm.) Bisque socket head with sculpted short brown hair terminating in detailed forelock curls and defined with brushstrokes overall, painted pale blue eyes in dee...moreply set sockets, heavy upper eyelids with black eyeliner, short feathered brows, accented nostrils, closed mouth with shaded lips, composition and wooden ball-jointed body, wearing antique navy blue serge sailor suit with brass buttons, stockings, undergarments, and leather shoes. Condition: generally excellent. Marks: 153 S&H. Comments: Simon and Halbig, circa 1910, from its very limited art character series of dolls. Value Points: remarkable depth of sculpting and expressiveness on the very rare character, made for one year only, and enhanced by superb bisque and painting, fine antique costume. Ex-Lucy Morgan Collection. 18" (46 cm.) Bisque shoulderhead with perfectly-oval face, defined throat hollow and shoulder clefts, brilliant cobalt blue glass eyes in deeply-set sockets, dark eyeline...morer, painted lashes, brushstroked brows, closed mouth with accented lips, delicate rose blushing, unpierced ears, brunette human hair over cork pate with rare wax coating, kid-stretched-over-wooden poupee body with shapely torso, kid-over-wooden upper arms, thighs and upper calves with dowel jointing, bisque arms to above the elbows with cupped hands, bisque lower legs with bare feet. Condition: generally excellent, body especially sturdy. Comments: French, circa 1867, the poupee was likely created to present at the important Paris International Exposition of that year. Value Points: the extraordinary beauty of the poupee with notable definition of features is enhanced further by very rare early body in pristine condition, and wearing lovely antique gown, undergarments, leather shoes, coronet and coral necklace. 17" (43 cm.) Bisque head with flat-cut neck with swivel attachment to matching shoulderplate, oval-shaped face with high domed forehead, painted blue eyes in deeply set s...moreockets, dark upper eyeliner, grey eyeshadow around the eye, arched brows, aquiline nose with accented nostrils, closed mouth with impressed lip corners, shaded ears, blonde mohair curly wig on cork pate, stretched-kid over wooden body with dowel-jointing at shoulders, elbows, hips and knees, bisque hands with artfully sculpted cupping, wearing antique gentleman's woolen costume with shirt, tie, woven undergarments, black socks, leather shoes, and beaver opera top hat. Condition: generally excellent. Comments: French, circa 1867, from an exceptionally rare series of dolls likely created for the Paris 1867 International Exposition; only six other examples of this model are known including an example costumed as the Princess de Lamballe, sold by Theriault's in the 1996 auction A Fully Perfected Grace. Value Points: outstanding quality of modeling and bisque on this extremely rare model, wooden body with bisque hands. 20" (51 cm.) Bisque socket head, very deep blue glass paperweight inset eyes, thick dark eyeliner and lushly-painted lashes, mauve-blushed eyeshadow, brushstroked brows, ...moreaccented eye corners, shaded nostrils, closed mouth with shaded and outlined lips, pierced ears, blonde mohair curly periwig over cork pate, French composition and wooden fully-jointed body with tiny waist and accentuated derriere, straight wrists. Condition: generally excellent, original body and body finish. Marks: Depose Tete Jumeau Bte SGDG 9 (head) Jumeau Medaille d'Or Paris (body). Comments: Emile Jumeau, circa 1885. Value Points: very fine bisque and complexion, original wig, rare body style that is designed to enhance the snugly-fitted antique silk faille Marquis costume with elaborate embroidery, lace jabot, and leather shoes signed Jumeau Med'Or Paris. 10" (25 cm.) A bisque head child doll with sculpted blonde hair, blue glass eyes, dark eyeliner, blushed cheeks, closed mouth, firm carton torso and legs, wire upper arms...more, metal hands, is standing upon a tinplate base with three spoked wheels. When wound, the base moves forward and in circles in a merry manner. Condition: generally excellent, mechanism functions well. Comments: Vichy, circa 1865. Value Points: charming early mechanical toy with rare sculpted hair, wearing original silk costume in the court manner, with flower-bedecked coiffe. 8" (20 cm.) 7"d. x 11"l. Of beautifully grained woods in artfully-arranged marquetry, the desk has a scalloped rim with bronze edging, two drawers, cabriole legs, and is ...morerichly ornamented with bronze drawer pulls and figural head mounts on the legs. Excellent condition. French, circa 1865, of the luxury archetypal of the fine Parisian store Maison Giroux. 17" (43 cm.) Bisque socket head, dark blue glass sleep eyes which operate from a lever at back of head, painted lashes, thickly brushstroked brows with feathered detail, ...morerose-blushed eyeshadow, accented eye corners and nostrils, slightly parted outlined lips, two rows of tiny porcelain teeth, pierced ears, brunette mohair wig, French composition fully jointed body. Condition: generally excellent. Marks: J. Steiner Bte SGDG Paris Fre B 11 (head) (original Steiner label on torso and signed J. Steiner eyes). Comments: Jules Steiner, circa 1885. Value Points: most endearing boy with beautiful decoration of eyes, wire lever eye movements, original signed body, wonderful antique teal blue silk costume with elaborate metallic trim, antique boots, carrying brass bugle. Ex-Lucy Morgan Collection. 18" (46 cm.) Bisque shoulderhead with very plump face and defined double chin, textured complexion, cobalt blue glass inset eyes with heavily-modeled eyelids, delicately-...morepainted lashes and brows, accented nostrils and eye corners, closed mouth modeled as though open with parted lips revealing two rows of tiny sculpted teeth, unpierced ears, blonde mohair wig over cork pate, plump kid poupee body with gusset jointing at hips and knees, bisque arms to above the elbows, lovely antique dress, undergarments, woven bonnet with arrangements of flowers, stockings, ivory satin shoes marked C.C. Condition: generally excellent, few original kiln specks on face. Comments: French, circa 1860, the maker of this very rare early period poupee is indefinite; a near duplicate model with painted eyes was featured on the cover of Doll News in Spring 1997 and also on the cover of Lady Dolls of the 19th Century by Florence Theriault, with possible attributions to Adelaide Huret or Georges Most who registered a French design in 1860 for sculpted teeth in dolls (see Encyclopedia of French Dolls by Theimer, page 419). Value Points: extremely rare doll with exceptional sculpting around the eyes, exquisitely-detailed teeth, rare early body with bisque arms, lovely original costume. 2" (5 cm.) inside head width. Of very fine woven tulle with two woven wire frames that are covered with wrapped silk and ruffled lace, the bonnet is resting in a wooden b...moreox with blue brocade, the box having a center medallion courtly image. Excellent condition. Circa 1865. 16" (41 cm.) Hand-pressed bisque swivel head with plump facial modeling on kid-edged bisque shoulder plate, painted blue eyes with sculpting detail of eye sockets and ric...moreh decorative glaze on the lower eyes, heavily modeled eyelids with black eye-liner, delicately painted lashes, feathered brows, accented nostrils and eye corners, closed mouth, accented lips, unpierced ears, blonde mohair wig over cork pate, original gutta percha poupee body based upon the Huret depose with jointing at hips, knees, shoulders and elbows. Condition: generally excellent, some typical restoration of body. Marks: Medaille d'Argent Huret 22 Boulevard Montmartre Paris Exposition Univers. 1867 (torso stamp). Comments: Adelaide Huret, circa 1865. Value Points: a fabulous example of the signature French doll, having desirable traits of swivel head, uniquely painted eyes, unique deposed Huret body in superb original condition, wearing antique costume of her era, including cream leather slippers (unsigned) in the Huret manner. 10" (25 cm.) The three-shelved etagere is fashioned of elegantly-grained tulipwood borders enclosing center panels of elaborate marquetry which is repeated on the single ...moredrawer front, with cast bronzed legs having mask figurals at each corner and hoof feet. The drawer opens to reveal a cast brass plate with the incised inscription "Huret". Excellent condition. French, circa 1860, the prestige firm of Maison Huret specialized in creating elegant "real people" furnishings in the 18th century court manner; for a very few years, after Adelaide Huret presented her luxury poupee, the firm presented the same furnishings in a size for display with that doll; no other example of this superb masterpiece is known to exist. 20" (51 cm.) Bisque socket head with angular slender face depicting an older boy, painted blue eyes set in well-defined sockets, black upper eyeliner, one-stroke brown br...moreows, closed mouth with full lips, solemn expression, brunette human hair, composition and wooden ball-jointed body. Condition: generally excellent. Marks: 150 S&H 2. Comments: Simon and Halbig, circa 1910, created for the art reform movement. Value Points: very rare model with superlative bisque and painting, fine lustrous complexion enhance the deeply-sculpted features, original body and body finish, antique costume comprising brown woolen short pants, brushed woolen vest, cotton shirt, cap, brown socks, and rare saddle boots, along with silver pin "Baseball Fan 1908". 28" (71 cm.) Bisque socket head with slender elongated facial modeling of lady, brown glass "flirty" eyes, dark eyeliner, heavily-modeled eyelids, mohair lashes, painted ...morecurly lashes, slightly-modeled brushstroked brows with feathered details, accented eye corners and nostrils, closed mouth modeled as though open in a dimpled smiling expression, row of painted teeth, well-modeled unpierced ears, auburn mohair extended-length wig, composition and wooden ball-jointed body, wearing antique costume with undergarments and kidskin shoes. Condition: generally excellent. Marks: 1388 Germany Simon & Halbig S&H 12. Comments: Simon and Halbig, circa 1910. Value Points: extremely rare model, whose rarity is rivaled by her exceptional quality of sculpting, bisque and painting of nearly-lifelike features, fine antique wig, original body and body finish. Ex-personal collection of Richard Wright from whose estate auction the doll was acquired by Margaret Lumia. 20" (51 cm.) Bisque socket head with glowing amber-tinted complexion, brown glass paperweight inset eyes with unique tilt of eye socket, black eyeliner, lushly-painted la...moreshes, brushstroked dark brown brows feathered upward at the outer ends, accented nostrils, closed mouth with richly-shaded lips, pierced ears, black human hair wig in upswept coiffure, French composition and wooden fully-jointed body with straight wrists. Condition: generally excellent. Marks: Depose Tete Jumeau Bte SGDG 9 (head) Jumeau Medaille d'Or Paris (body). Comments: Emile Jumeau, circa 1885, early period tete model with original straight wrist body which has original painted finish exactly complementing the facial complexion. From the series of exotic dolls introduced by Jumeau, this model was likely influenced by the Japonisme movement that swept Paris during the 1880s. Value Points: very rare doll preserved in impeccable condition, with flawless glowing complexion, original body and body finish, and superb original couturier silk Asian costume with embroidered details, hair ornaments, and original silk brocade heeled shoes with leather soles that are gilt lettered "Bebe Jumeau Med d'Or Paris", size 9. 17" (43 cm.) Of finely grained exotic satinwood and mahogany, with arched crest having inlay fan design and a leather center panel with raised design of sunflowers that a...morere heightened with painted detail, and with inlay marquetry borders. Excellent condition. English, 19th century. 12" (30 cm.) x 9" box. The heavy card stock box has lithographed cover image of a young girl at baking table, and opens to reveal well-fitted interior containing blue ena...moremelware including rare funnel, sieve and more, along with cups and saucers, casserole pot, linens, cutlery, a cardboard box designed to hold ginger cookies, and a cook book by Anna Jager with many German-language recipes and household tips. Generally excellent. Germany, circa 1900. 5" (13 cm.) grandma. 8" x 5" box. Arranged within a heavy card stock box with lithographed image on the cover of Little Red Riding Hood are characters and accessories fro...morem that classic story, including all-bisque girl with knit red costume and hooded cap, bisque head Grandma with blue glass eyes, aged features, bisque limbs, wearing black silk dress and undergarments, and paper mache figure on base of brown wolf, along with basket, pot, tart, and bread. Excellent condition. Germany, circa 1890, a well-preserved toy presentation. 8" (20 cm.) An elaborately woven basket with loop handle and silk ribbons hinges open at the center to reveal a well-fitted interior featuring two all-bisque black babies...more with painted features, jointed arms and legs and red silk sashes. The dolls are tucked in with folded ribbon lines, tin wash rubs, and three cardboards with gilt paper edging, each with an arrangement of accessories including combs, soaps, mirror, beads, and even two tiny, tiny black dolls. Condition: generally excellent. Comments: for the French market, circa 1890. Value Points: a fabulous presentation is preserved in fine unplayed with condition. 19" (48 cm.) Sculpted composition head depicting a highly characterized young girl, having rosy complexion, small painted blue eyes with accented eye corners, shaded nost...morerils, closed mouth with modeled space between the lips, well defined chin and cheek bones, original brunette mohair wig, composition fully-jointed body, wearing original plaid woolen dress, undergarments, leather shoes, knit cap. Condition: generally excellent. Comments: Marion Kaulitz from her Munich art studio from which she was instrumental in promoting the art character doll reform movement of the early 20th century. This doll, according to a note attached to her undergarments, was purchased by its original owner, an American child, who was attending school in Munich in 1910. Value Points: outstanding original and unplayed with condition of the flawlessly preserved and artistically rendered doll, original studio body, costume and painting. The doll appeared on the cover of Theriault's 2001 catalog If Wishes were Horses. Ex-Lucy Morgan Collection. 17" (43 cm.) Solid domed pink-tinted bisque socket head depicting young girl with sculpted brown hair having loose curls at the forehead, drawn into two narrow coiled bra...moreids at nape and decorated with a blue glazed ribbon, sculpted facial features, intaglio dark blue eyes with large black pupils and white beaded eye dots, short feathered brows, rounded nose with accented nostrils, closed mouth modeled as though open with two rows of teeth, accented lips, sculpted ears, composition and wooden fully-jointed body, antique school girl costume with multi-layered cotton and flannel petticoats, pantalets, skirt, shawl, apron, shoes. Condition: generally excellent. Marks: Heubach (in square) 8050 Germany 1. Comments: Gebruder Heubach, circa 1910. Value Points: the rarity of this model is delightfully enhanced by the wonderful laughing expression, unusual sculpted hair, deeply impressed eye crinkles and impressed cheek dimples, finest quality of bisque. Ex-Lucy Morgan Collection. You've been outbid to L****Z! to YOU! 22" (56 cm.) Bisque socket head portraying a young boy with highly characterized angular features on oval shaped face, deeply sculpted blonde hair in boyish fashion with ...moretousled forehead bangs, large sculpted ears, painted light blue eyes, black upper eyeliner, feathered brows, strong nose with accented nostrils, full lips of closed mouth, shaded and outlined lips, sculpted philtrum and chin dimples, strong definition of chin and cheek bones, composition and wooden ball-jointed body, well costumed in antique black woolen suit, red woolen vest, cotton shirt, wool leggings, leather saddle shoes. Condition: generally excellent. Marks: K*R 102. Comments: Kammer and Reinhardt, circa 1910. An identical sculpture, Knabenbuste, was modeled by the illustrious German artist Arthur Lewin-Funcke in 1898 and then, in 1910, was transformed by Lewin-Funcke into this rare model for Kammer and Reinhardt's art character reform series. The intriguing story of Lewin-Funcke's connection with the K*R doll firm is told in Cieslik's important work, German Doll Studies, page 231. Value Points: extraordinarily rare model in superb size, with artistic provenance, and outstanding quality of sculpting, bisque and painting. Few examples are known to exist, and the doll is one of the world's rarest. Ex-Lucy Morgan Collection. 28" (71 cm.) All-carved wood doll with dramatically-shaped head which features a heart-shaped face and very full rounded back of head, elongated throat, distinctive nose,...more fully-carved pixie-like ears, heavy modeled eyelids, blue downcast eyes, red eyeliner with delicately painted upper lashes, tinted brows, closed mouth, painted hair with exuberant tendrils of curls around the forehead, sculpted collar with painted ruffled details, slender torso with defined waist, dowel-jointing at shoulders, elbows, hips and knees, flat feet with painted brown slippers, original kid-over-wooden upper arms, hips and upper legs. Condition: generally excellent, original finish throughout, some minor typical rubs on face. Comments: Grodnertal, circa 1820, the doll is shown in Doll Collectors Manual, 1964, in an article by Ruth and E.C. Mathes, indicating that at the time the doll was in the collection of Lucille Grimes of Encinitas, California. Value Points: outstanding example of luxury quality wooden doll from the Grodnertal, its rarity features include grand size, unusual kid-over-wood body parts, exuberant painting of hair, unusual shape of face, sculpted collar, and wearing early fine early costume. A Treasury of Nostalgia. Artist dolls, collectibles, and holiday gifts for all the seasons and every occasions. © 2017 Theriault's. Antique Doll Auctions.